What It’s About: When terrorists hijack an American airliner flying out of Greece the Delta Force is sent in to rescue the hostages. Why Watch It Today? : The film climaxes with an ambush on this date in 1985. 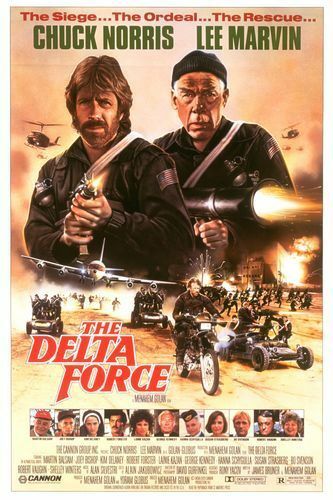 The first half of the film plays like a very late Airport sequel in which the plane is hijacking and George Kennedy’s Patroni has joined the priesthood, while the second half is a more typical Chuck Norris action film from the mid-80s. The disconnect between the two styles can be fun-provided you are accompanied by some game friends and perhaps your favorite alcoholic beverages. This entry was posted in "Based on a True Story", Action, Adaptation, Airplanes, Disaster, Drama, Event Film, Movie of the Day, Special Operations, Thriller, War Movies and tagged Alan Silvestri, Bo Svenson, Cannon, Chuck Norris, co-production, comes out of retirement, Delta Force, Eric Norris, Golan-Globus, Greece, hijacking, hostage, hostage situation, Israel, Joey Bishop, Kevin Dillon, Kim Delaney, Lainie Kazan, Lebanon, Lee Marvin, Liam Neeson, Martin Balsam, maverick, Menahem Golan, motorcycle, pilots, Robert Forster, Robert Vaughn, rocket launcher, Shelly Winters, Steve James, stewardess, super motorcycle, terrorists, the declining years, U.S. Navy, Yoram Globus.